When it comes to kids fashion, trends change in an instant. One day the colors trend toward neon and the next month the colors are neutral. For any parent, keep the kids clothes up to date can be a full time job and expensive. Zipz shoes are a better way. Zipz shoes are the world’s first, true, and only interchangeable shoe system! Our inventive and worldwide patented technology in both utility and design provides our customers the ability to interchange shoe components in the same size as they see fit. Whether its fashion, function, or fun Zipz shoes have it covered. Simply purchase a completed pair of Zipz and then accessorize your footwear purchase with more Zipz “Covers” now or in the future. You can match any Zipz “Covers” from our Offshore, Boardwalk, X Games, or Cali-Classic collections with the same size Zipz outsole to create one of a kind mix and match shoes to suite whatever mood you’re in. The Giveaway will open up on 7/22/14 at 12:01 am EST and Close on 8/1/14 at 11:59 pm EST. Open to U.S. residents only. a Rafflecopter giveaway Mission Giveaway started with Madame Deals and her $100 story where with $100 several people received the help they needed. We are on a mission to help people help each other! We have gathered a group of bloggers that want to make a difference. Together we are Mission Giveaway! To ask about becoming a sponsor, please contact Amee or Dawn at madamedealsmedia@yahoo.com for details. Take a look at our Media Kit to see what Mission Giveaway has to offer. 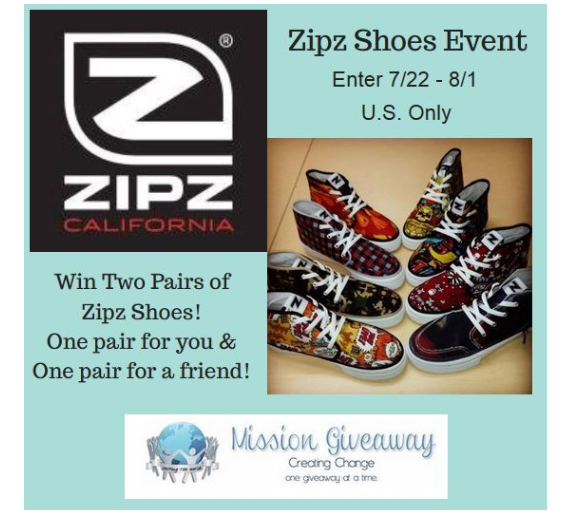 Are you a blogger that would like to participate in Mission Giveaway? Find out how you can join us. Find our official Terms and Conditions on the Madame Deals Media page. I'd love to try these shoes! They look so cool!